4-5 stars from a young adult perspective – teens will swoon over Alex. 3-4 stars from those young at heart, due to predictability. Cat is suffering from heartbreak – a hot boy from school used Goodreads, of all places, to learn about her and figure out a way to hook her emotionally, since the physically was a given, all to win a bet. Cat learns a valuable lesson, and young readers will too. This ends badly for Cat, leaving her humiliated more so than heartbroken. Meanwhile, the douche-noodle jock is seen as a hero, hilarious instead of seen as rotten for his actions. Cat's an avid reader and aspiring writer, daughter to a single young mother who is an eccentric artist. Alex used to be Cat's best friend and neighbor. The brooding loaner, supposedly bad boy, has always had a crush on Cat, and swoops in to save the day, like the unlikely hero he truly is. Alex has problems, having an elderly grandmother in a home as his guardian, but having to work and pay his own way while only 17, all the while trying his hardest to gain a scholarship to college and get out of the town that looks down upon him. ...and a faux relationship is born to prove Cat has moved on, with the one boy she can count on unconditionally. I won't ruin the plot from there. Young adults will swoon over Alex. Cat is a solid heroine to learn from during the journey. This friends-to-crushes novel is sugary sweet and gives the warmest of fuzzies. The grown adult in me found it a bit too sweet and predicable, but enjoyed it nonetheless. I highly recommend to actual young adults, and leave it up to the young at heart to decide if the book is right for them. I look forward to reading more by Amanda Ashby in the future. Young Adult age-range: 12+ for this sweet romance. 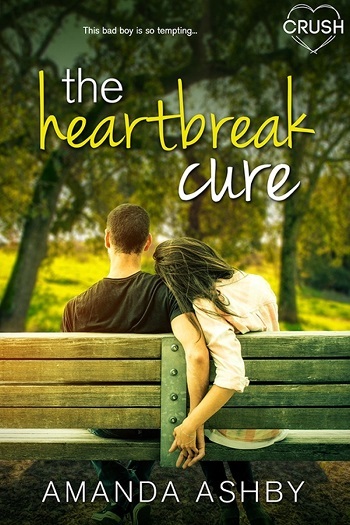 Reviewers on the Wicked Reads Review Team were provided a free copy of The Heartbreak Cure by Amanda Ashby to read and review.